Learn more about domain names in this primer for beginners. This tutorial is part of our WordPress installation step-by-step training module, where we show you how to install a WordPress site or blog on your own domain name with no coding skills required. Your domain name is your unique web address. Because your domain name is how most people will find your business online and identify with your brand, it’s important to have as much control of your domain name as you can. You can register a unique domain name for around US$10-$15 per year or less, depending on the domain name registrar you choose. Technically speaking, you don’t own a domain name, you lease it. The Internet Corporation for Assigned Names and Numbers (ICANN) is the organization responsible for managing and administering domain names worldwide. Make sure that the domain name is registered in either your name or your business name. This is especially important if someone else has registered your domain name on your behalf (e.g. a web developer or web services agency). Note: It’s typical for web developers or agencies who register domain names on behalf of their clients to enter their contact details in the ‘Technical Contact’ or ‘Admin Contact’ fields. The ‘Registrant Contact’ details, however, should be in your name or your business name. The other important aspect of controlling your domain name is to try and secure the entire domain name ‘family’ if possible, as well as social media usernames that represent your brand or business name. This prevents your competitors from controlling online assets that could be identified with or mistaken for your business. Having a web presence has become so important to how we do business today that anyone contemplating starting a new business seriously needs to consider whether to use a name if the domain name version is already taken by someone else. Would you go through all the bother and expense of promoting a new business if every domain name related to your business belonged to someone else? Probably not. What would be the point of spending money and working hard to promote and advertise your business only to send more and more potential customers to someone else’s website? By focusing too narrowly on your local market, you could fail to see the wider global implications of the importance of safeguarding your brand online. For example, many small businesses in Australia will register a .com.au domain for their business, but not necessarily the .com version of the same domain. This is the same for business owners all over the world – businesses in the UK will register a .co.uk domain, South African businesses will register a .za domain, Canadians a .ca domain, etc., but not the entire domain family. If someone else owns another version of your domain, they could benefit from the traffic being generated by your efforts. This may not seem like a big deal, but it’s something that can be prevented and that can help you avoid headaches later on, especially if you start growing your presence online internationally. Not owning all of the domains associated with your business can weaken your brand. As mentioned earlier, one way to safeguard your business brand online is to register all of the variants of your domain name. Registering a number of keyword-rich domains related to your business – you can then use these to build separate sites focused on niches in your industry and drive targeted traffic to your main web site, or develop these domains into separate divisions of your business. It gives you a local / global monopoly over the brand. It prevents competitors from securing those domains and diverting traffic to their sites. It stops people registering business names offline that are similar or related to your domain. It can significantly increase the resale value of your business. Think about it … what other strategy can you think of that for a few dollars per year, will safeguard your business brand online and prevent potential competitors both locally and internationally from promoting their business using a similar name as yours? Now … you may be wondering what to do with all of those domains after you have registered them. The simplest thing to do is to redirect all of these similar domains that you now own to just one domain (e.g. the main domain that you will be promoting). Domain Redirect: You can set up the domain with a simple redirect code which then sends visitors from that domain to your main domain. Parking and Redirecting domains is a fairly simple process. You can do this in your webhosting control panel. Once you have your domain portfolio secured, you don’t have to build a website for each domain. Just park or redirect your domain and you’re all done! The web has undergone many significant changes. One of these is the increasing relevance and dominance of social media sites like Facebook, YouTube, Twitter and dozens of other social networks and bookmarking sites. Establishing an online presence in all major social networks is important not only in terms of creating a growing awareness for your business online, but it also helps to generate new sources of traffic and customers for your products and services. The FIRST thing to do, then, is to secure your brand name with as many social sites as you can before someone else takes your name. Many social sites allow you to specify a username when creating an account that will then become part of your account’s web address for that site. These web addresses are typically called a vanity URL. By using your business name as the username on these sites, you can create vanity URLs that will help to strengthen your brand online. What if your business name is a unique or trademarked name? The same advice given earlier applies here … register all domain names related to your business and create as many accounts as you can with social networking and social bookmarking sites using your unique username. There is one more strategy you can use to protect your brand online … register keyword-rich domains related to your products and services. This works well for businesses that have an unusual brand name (e.g., think of ‘Hammacher Schlemmer’, the giant American Catalog company), but would also like to have control of the main keywords related to their products or services. Using a completely made up example, let’s say that you want to build a global online brand with a funky name like HowDooYooDoo. Using the strategies discussed earlier, you would register the domain name HowDooYooDoo.com and its domain family (i.e. the .net, .org, .biz, .us, etc ). Now … what if one of the products you plan to sell through HowDooYooDoo is a line of funky greeting cards? The name ‘HowDooYooDoo.com‘ may be unique sounding and even have a fun, catchy ring to it, but it is meaningless to search engines (and probably also to most people searching online for ‘greeting cards‘). Next, you would do a ‘bulk’ domain search to see what keyword-related domains are available. You would then go through the list, select the domains that appeal to you and register these. Once you have registered these keyword-based domains, you could then either redirect the domain to your main website or a subfolder of your site (e.g. ‘HowDooYooDoo.com‘ or ‘HowDooYooDoo.com/funky-greeting-cards‘), or build an entire network of sites (one for each domain you have registered), and make the content specific to the topic of your domain name (e.g. sell oversized greeting cards at ‘GiantGreetingCards.net‘, and sell funny birthday greeting cards at ‘FunnyBirthdayGreetingCards.com‘). Once you have a few strategies in place to capture your visitors details (e.g. a newsletter), you can then direct visitors to all of the sites that you own and start building segmented customer lists. You can search for keyword-rich domain names that have expired and add these to your domain portfolio. Expired domains are domain names that the previous owner has chosen not to renew. Once a domain name expires, it becomes available for anyone to purchase. Every day, thousands of domain names expire. Expired domains can be quite valuable depending on a number of factors, such as domain age, domain name length, number of active links pointing to the domain, etc. Be aware, though, that this is a highly competitive market – many expired domain buyers use sophisticated tools and software to identify and bid on keywords that are about to expire. ICANN, the body responsible for managing domain names globally, assigns the actual task of processing domain name registrations and domain name renewals to accredited agencies called Domain Registrars. Most Domain Registrars also require you to maintain a valid source of payment in its billing section (e.g. a current, valid credit card or PayPal account details). If you plan to outsource your domain management, this can present a security issue, as whoever is managing your domain names may ask you to provide them with your full credit card details. For this reason, I recommend that you consider either managing your domain names yourself, or entering the payment details yourself when setting up your Domain Registrar account so that only you have access to credit card numbers, security codes, etc. Hopefully, the above information has helped you understand more about the importance of protecting your brand online and given you some new ideas and practical tips on ways to gain a massive competitive business advantage. The information below will help you gain more control over your domain name(s). Make sure that whoever registers your domain name creates a separate Domain Registrar account for your business and provides you with the account login details. See the point made earlier about keeping your payment details secure. Confirm that all domain names will be registered using your name or business name and your contact details as the Domain Name Registrant. Ask for copies of all domain name registration confirmation emails to be forwarded to you. Enter these details in your master document (e.g. your master spreadsheet). Log into your domain management area and check that your domains have been set to ‘lock’ and ‘auto-renew’ in your Domain Registrar’s administration panel. It only costs around $10 – $15 or less per year to register a domain name for most extensions. Beware of anyone offering domain name registration services at a significantly higher cost, especially “official-looking” domain name transfer and renewal forms sent via mail from competing domain registrars. Ensure that all domain names are registered under your name / business name and that the domain has been set to ‘lock’ and ‘auto-renew’ to prevent accidental loss through unauthorized transfers or domain expiration. Register as many domain names in your ‘domain family’ (and keyword-related domains) as possible. This is the cheapest way to prevent competitors from stealing your traffic and protect your business brand. ICANN – Internet Corporation for Assigned Names and Numbers official website. GoDaddy – Domain name registrar services, domain auctions, expired domain backorders, etc. Learn how to register a domain name for your website or blog. This tutorial is part of our WordPress installation tutorials, where we show you how to install a WordPress site or blog with no coding skills required. Before installing or setting up a WordPress site or blog, you will need to register a domain name. Although WordPress provides users with a “hosted” and a “self-hosted” option, we recommend that you consider choosing the self-hosted option when setting up your WordPress website or blog. This gives you complete control of your own presence and requires having your own domain name. If you’re not building a digital presence on your own domain name, then you are growing someone else’s asset! For this reason, unless you’re doing work for clients, we recommend installing your WordPress site or blog on a domain that you own or control. So … the first step BEFORE you install WordPress is to register a domain name. In this tutorial, we are going to use GoDaddy to show you how to register a domain for your site. GoDaddy’s domain registration prices are reasonable and they provide excellent domain name management and administration services and an easy-to-use domain name control panel. You can use whatever registrar you like, as the registration process shown in our tutorial is similar for all domain service providers. Choosing a great domain name is not always a simple or straightforward process. You can spend a lot of time thinking up a good name, only to find out that the domain name you really want is already taken. Register your domain with an ICANN accredited registrar. The Internet Corporation for Assigned Names and Numbers (ICANN) is the non-profit corporation responsible for assigning and managing domain names. Specifically, ICANN coordinates the Internet Assigned Numbers Authority (IANA) functions, which are key technical services critical to the continued operations of the Internet’s underlying address book, the Domain Name System (DNS), which ensures that computers know where to find each other and that the world has one global Internet. Registering your domain name with an ICANN accredited registrar ensures that your domain name is managed by a regulated service that complies with all standards and protocols. Domain name must be available. There are no special requirements to register a .com, .net, or .org domain (other than they must not be already registered to someone else!) If the domain name you want is already registered to someone else, the next tip can help you. If the domain name you would like to register is already taken, you may still be able to acquire it in the future if the domain name owner allows it to expire, or if the owner decides to sell it. 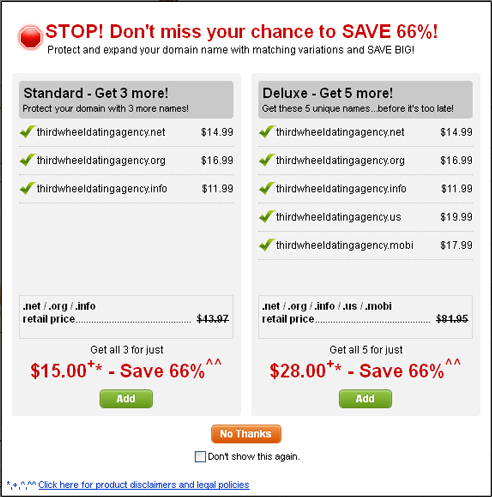 Expired domains, domain name auctions and domain flipping (i.e. buying a domain and immediately putting it up for sale at a premium price) are typical methods used to acquire pre-owned domains. You can normally purchase a .com, .net, or .org domain for around $10-15 per year or less and choose the renewal period from one to ten years (the longer the registration period, the more you save on domain registration and renewal fees). .COM is still the preferred TLD (Top Level Domain) option. 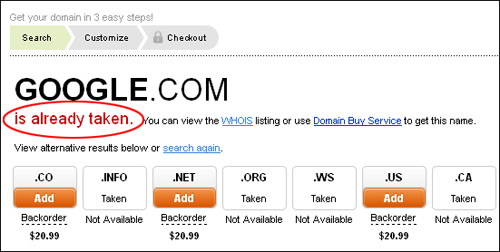 If you can get your domain name with the .COM domain extension, you should register it. .COMs are still the most recognizable top level domains (TLD) and most people will generally type the .COM version first when searching for a website. Preferably, you should include the .COM version of the domain name you want, even if you plan to do business in a country that has its own domain extension (e.g. .com.au, .co.uk, etc …). Additionally, consider also registering the .NET and .ORG versions of the domain. You can easily set up domain names with different extensions to send all traffic to your main domain name. This is covered in a separate tutorial. The shorter your domain name is, the better. A shorter domain name is easier to remember and print on stationery, signage, etc. Having said this, keep in mind that it’s getting harder to find great domain names that are also shorter in length. They are still out there, you just have to look a little harder. Make it easy to spell. Avoid domain names that are very difficult or tricky to spell. It’s best to avoid “clever” variations that can end up confusing online users (and even send visitors to your competition). Sometimes – and especially when a good domain name is already taken – it can be tempting to try and be clever. For example, doma1n.com (substituting the letter “i” with the number “1”), or domayn.com. Additionally, try to avoid using numbers like “4” as a substitute of “for” (e.g. Work4Yourself.com) and “2” as a substitute of “to”, as you will then find yourself continually having to tell people that it’s “4” not “for”. Similarly, avoid things like “u” for “you”, etc. if possible, also try to avoid domain names with adjoining or truncated letters – e.g. gooddatingguide.com / goodatinguide.com, as this can be confusing and easily lead to misspelling by visitors. If your preferred domain name is already taken, you may be tempted to register the same domain with hyphenated words. While many SEO experts disagree about the pros and cons of using hyphenated domains vs using domains with no hyphens for search optimization purposes, the downsides of using a hyphenated domain is that it makes the domain name longer and more prone to errors, and if the non-hyphenated version is already in use by someone else, users may end up visiting a different website. If you choose to register a domain name with hyphens, then we suggest adding a hyphen between every word in your domain, e.g. my-business-website.com, instead of mybusiness-website.com or my-businesswebsite.com. Use your main keyword in your domain. Avoid using too many keywords in your domain or limiting your domain name to a very narrow niche. You want to avoid using a domain name that is very long or that looks spammy. Ideally, aim for a domain name with 2-3 keywords. Anything longer than this is called a long-tailed keyword and can significantly narrow your appeal from a larger audience to a “niche” market audience. In today’s global digital economy, it’s not smart to register a business name if all the domain names associated with that business name are already taken. If you have a brandable business name or business idea, therefore, we recommend trying to secure the entire domain ‘family’ if possible to protect your brand. If it makes sense, try to register both singular and plural versions of your domain name. e.g. AJCleaningService.com and AJCleaningServices.com. It’s a bad idea to build your business online using domains that contain trademarked terms (e.g. WordPressMarketingExperts.com). Using trademarked terms in your domain name can land you in legal hot water and potential lawsuits. If your business is built around another company’s products or services, try to find a generic term that will not infringe on the trademark or cause issues with copyright and intellectual property. 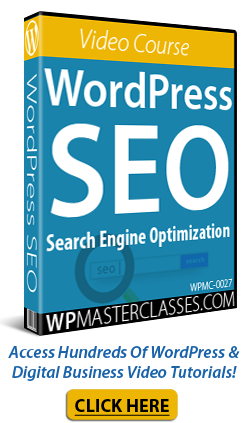 For example, we provide WordPress tutorials on this site. The term “WordPress” itself is trademarked and businesses that provide WordPress-related services are advised not to use it in their domain names. Hence, this site is called “wpcompendium.org” (allowed), and not “wordpresscompendium.org” (not allowed). Change your business name if the domain is taken. This may sound absurd, but if you haven’t registered a business name yet and you find out that the domain name(s) you were planning to register for your business have already been taken by someone else, then it may be worthwhile to consider using a different business name. As stated earlier, you need to carefully rethink about registering a business name if all the domain names associated with that name have already been registered by other parties. The results screen will show you if there are any extensions of a domain that are still available (e.g. .net, .org, etc.). 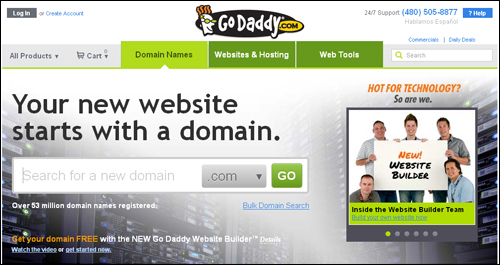 GoDaddy.com also offers a backorder domain registration service, which allows you to register your interest in acquiring a domain name if it becomes available in the future. Learn how to find keyword rich domain names quickly. If you want privacy protection (this hides your registration details from being made publically available), go ahead and select the option. We recommend skipping all of the optional extras for now, as we will show you how to set up your own web hosting and branded email address in other tutorials. An important option to consider before completing your domain name registration purchase is the length of time you would like to register your domain name for. Leave the default setting as is, or choose a longer registration period to save time and money on domain name renewal fees. 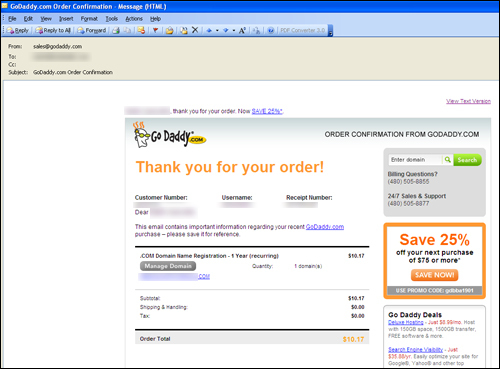 GoDaddy – Domain registrar services, domain auctions, expired domain backorders, etc. If you’re interested in learning how to buy, sell, and flip domains for profit, then check out this Domain Flipping resource. Congratulations! If you have completed all of the above steps and registered your domain name, then you are ready for the next step. WPCompendium.org - Free WordPress Step-By-Step Tutorials For Beginners!